Here at Stone Revellers, we’re always straight on to our next production. As you know for 40 years we have delivered a varied programme of shows – this time it is the comedy classic “Dad’s Army”. The show is being performed 12th to 15th June 2019 and we will be feeding our audience with Fish & Chips between acts! Cannot make those dates, need more information or cannot access the link? All auditions are open to all and we welcome you to Stone Revellers whether you are a current member or not. Our current show Director Martin Popov will make a neutral decision in the best interests of the show to deliver an excellent, balanced cast. Producers: Rob Stanway, Nichola Abbott and their team. Here’s all you need to know about our upcoming auditions for THE WEDDING SINGER – to be performed in the first week of April 2019 with a 13 week rehearsal process prior. A basic dance so that you can see what we’ll be doing in certain numbers if you’re a dancer! Simply turn up, fill out an audition sheet. All the above takes place at St Michael’s Hall and we welcome all members and non-members, whatever your age or ability – if you like the idea of being part of this enjoyable production then come to audition. ALL ROLES ARE OPEN and are judged on the auditions only. There is no bias or clique in our production team. It’s 1985 and rock-star wannabe Robbie Heart, who still lives in his grandmother’s basement, is New Jersey’s favorite wedding singer. He’s the life of the party until his fiance, Linda, leaves him at the altar. Shot through the heart, Robbie is so distraught that he makes every wedding as disastrous as his own. When he meets an Julia, an admiring young waitress, Robbie falls madly in love. The only trouble is that Julia is about to be married to a Wall Street shark, and unless Robbie can pull off the performance of a decade, the girl of his dreams will be gone forever. With a score that pays loving homage to the pop songs of the 1980s, The Wedding Singer takes us back to a time when hair was big, greed was good, collars were up, and a wedding singer might just have been the coolest guy in the room. ALL AUDITION PIECES ARE HERE IN PDF FORMAT and are referred to below by their page numbers. Simply follow this link, choose your character and you will find the relevant PDFs. You will also find the YouTube links to use below. The lead singer of a band. Handsome and charismatic. A truly ‘nice’ guy that has the classic lead singer aura and personality. Also a bit of a dreamer. In love with love until Linda leaves him at the altar and breaks his heart. Audition Piece – Pages 3-5 “Robbie’s Introduction”. Waitress. The pretty “girl next door” in looks and personality. Engaged to Glen but falls in love with Robbie and is conflicted as to who to choose. Empathetic, caring, and brave. Audition Piece: Pages 77-78 “Julia trying on her dress”. The wedding band’s keyboardist and one of Robbie’s best friends. Based on Boy George. He is sensitive and somewhat flamboyant. The foil to Sammy’s super guy attitude. He’s not-so in the closet, but the other guys seem oblivious. Julia’s cousin. Sexually promiscuous and always up for a good time, but wants to be loved and is looking for romantic fulfillment in all the wrong places. She is in love with Sammy. – Look at Holly’s last note in the song, that is the highest note of the show. The bass player in the wedding band and one of Robbie’s best friends. A total guy’s guy, but beneath his pretending to love being a bachelor he is actually in love with Holly. A smooth operator – at least he thinks he is. Julia’s fiancé. A Wall Street broker. He is rich, shallow, and materialistic. Constantly tries to buy Julia’s love with money. He is a womanizer. Robbie’s grandmother who raised him. Motherly but adventurous and always trying to remain “hip” despite her age. Robbie’s fiancé who leaves him at the altar. Keeps Robbie around as a back-up plan. Is more in love with the idea of Robbie being a rock star than she actually is with Robbie. We also have Couples (Harold & Debbie, Shane & Donatella, Crystal & Mookie); their various Wedding Guests; Stockbrokers; and impersonators. Impersonators are company members overall and will double up as wedding guests, couples and stockbrokers – but bring your best impression if you’d like to be considered for one of the celebrity impersonators! Small roles will be split between company throughout the show. Company roles include: David/Drunk Guy, Angie (Julia’s Mum), Cousin Steve, 2 Male Waiters (a couple). WE ARE LOOKING FORWARD TO WELCOMING YOU TO STONE REVELLERS! 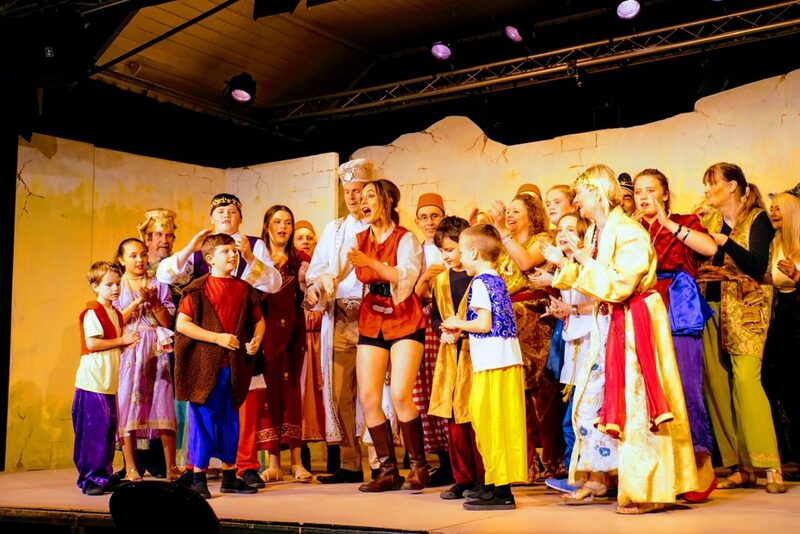 This year Stone Revellers present Al Baba and the Forty Thieves – 5th to 8th (inc Sat Mat) December 2018. The Character Information, Music and Audition pieces can all be accessed from the link below. What If you cannot access the link or you want further information? Email info@stonerevellers.org.uk – we will then email you any information you require. The Director will ensure any cast know who is called when. 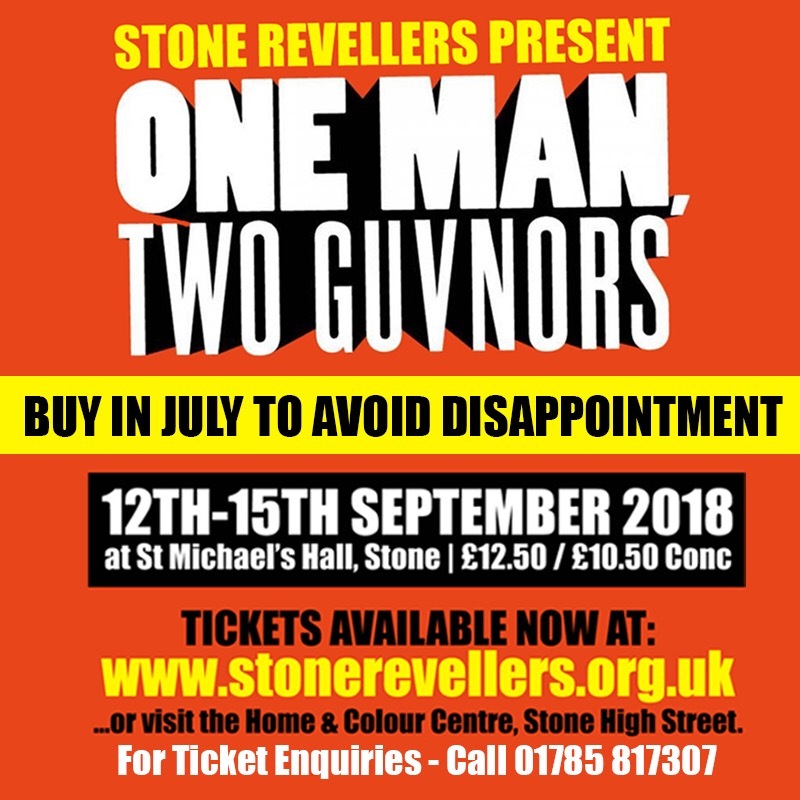 You can now buy your tickets for One Man, Two Guvnors here on our website, or by visiting Home & Colour (Call 01785 817307). For this highly anticipated production, we recommend ordering early to guarantee your seats, as tickets are already selling fast. 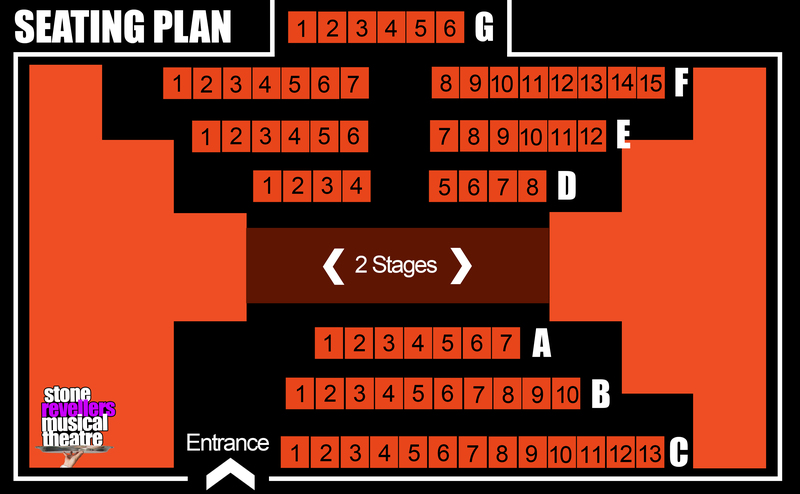 Tickets are £12.50 whilst concessions (under 16s or over 65s) are priced at £10.50. Proof of age will be required for concessions. 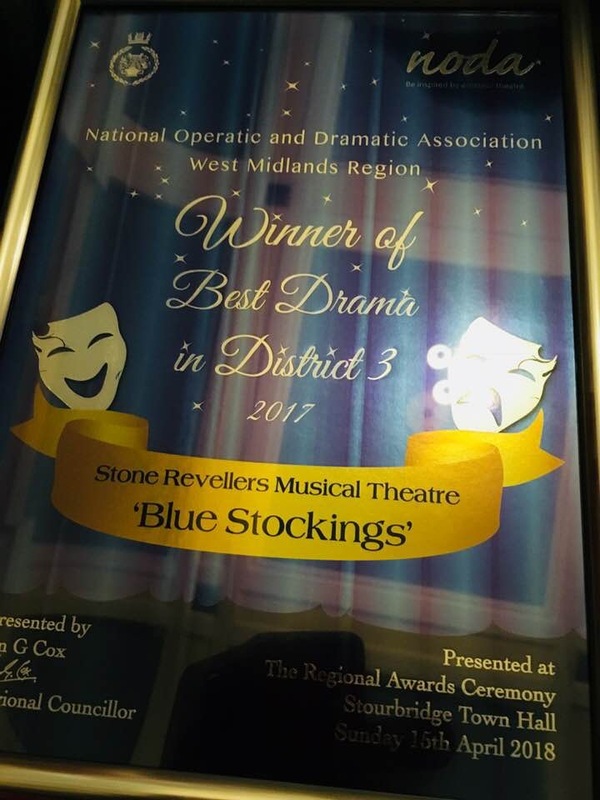 On the day of our 40th anniversary ball, Stone Revellers are proud to announce that our play, Blue Stockings, has received the NODA award for Best Drama in our Region – our third win of this prestigious award in the last four years. NODA (the National Operatics and Drama Association) is the major association for our industry. 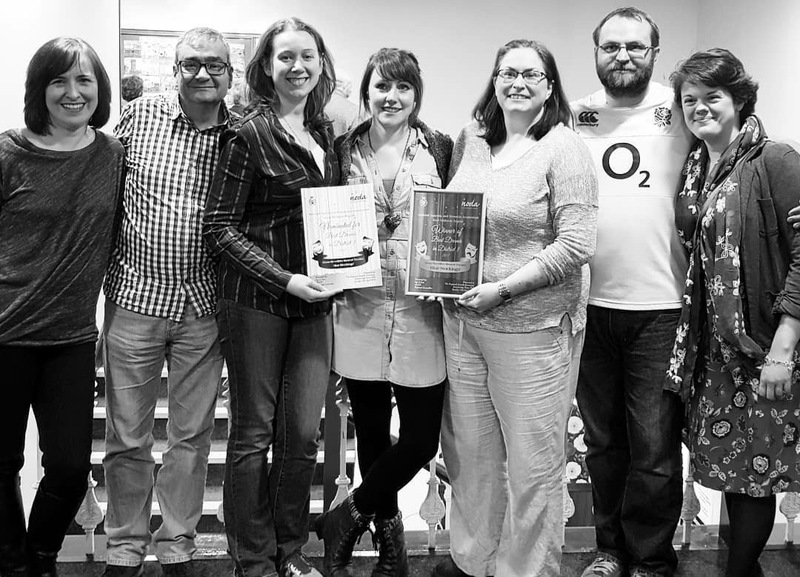 The West Midlands region is made up of 183 members, all societies like us, producing great community theatre. The show was directed by Samantha Green, assisted by Dan Rich, and this production was their directorial debut for Stone Revellers. Our previous wins were Jerusalem (2014) and A Midsummer Night’s Dream (2015). Congratulations to our cast and production team!